Soft to the eye and touch, imported cotton with delicate pink and yellow flowers on white ground, emphasized by embroidered trim created in West Germany. 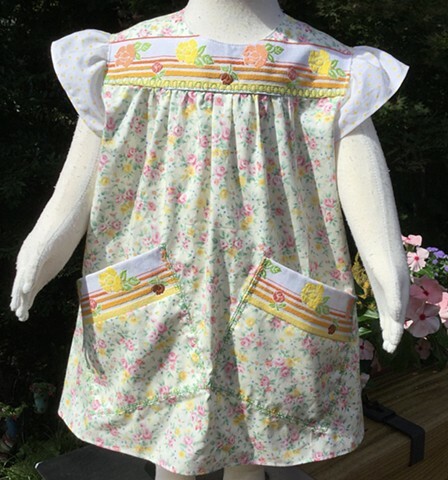 Size Toddler (1-2 years) dress offers two big slanted pockets, enhanced with yellow dotted sleeves and facings, back closure with two antique mother of pearl buttons and decorative stitching. $50, 100% cotton, made by the designer herself and shipped free to any address in the U.S. Thanks, Lezette Thomason, for fabric and inspiration.